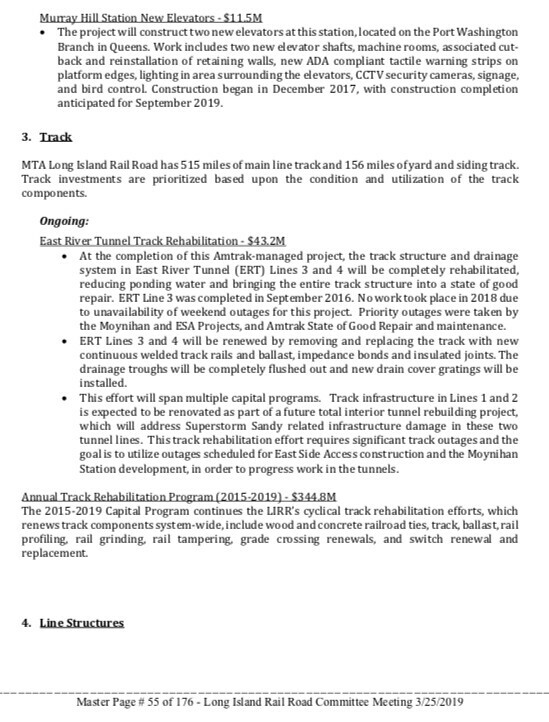 Due to LIRR Track Department labor resource issues, the planned BU date of December 2019 cannot be supported as other projects have been deemed higher priority and the project Beneficial Use Date revised to January 2021. Project-level Beneficial Use date revised from April 2019 to December 2019 due to further developments to accommodate the mitigation plan addressing availability of Signal Dept forces. 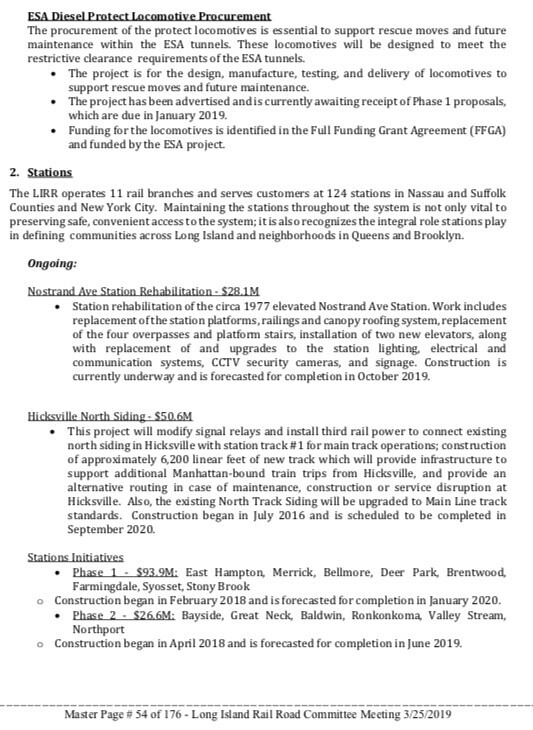 Due to competing priority LIRR projects, shortfalls in Signal Dept. resources [in both engineering/design labor, field labor, and materials] continue to be experienced by the project. This issue has delayed the Stage 1.2A [#3-XO] cutover and subsequent Force Account stages associated with Platform F Beneficial Use [Dunton Interlocking Modifications and Platform F Station Tracks]. The schedule for Stage 2 outlying switches [MET, Beaver, and Union] has also been affected. 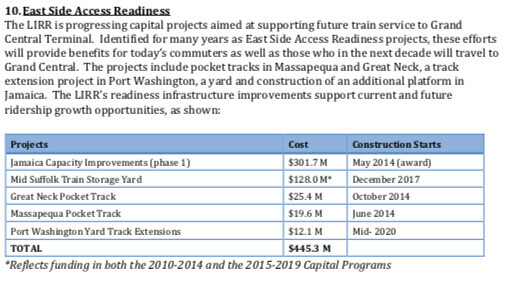 Milestones for Substantial Completion and Beneficial Use will be revised to 10/31/2020. Project is currently on hold due to pending real estate issues. These were reduced to design only in April; then all funding removed. 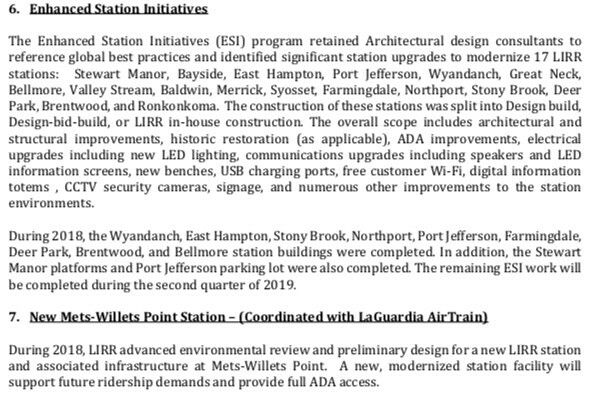 For Elmhurst and Republic stations, can't they just add crap platforms like the extensions at Forest Hills and Kew Gardens? In theory. However, they need elevators, new staircases, TVMs, etc. Platform extensions don't need these as the main stations should already have these. Republic is supposed to be part of the redevelopment of the Route 110 Corridor. I bet Republic will be in 2020-2024, but I am worried that Elmhurst will be cut. 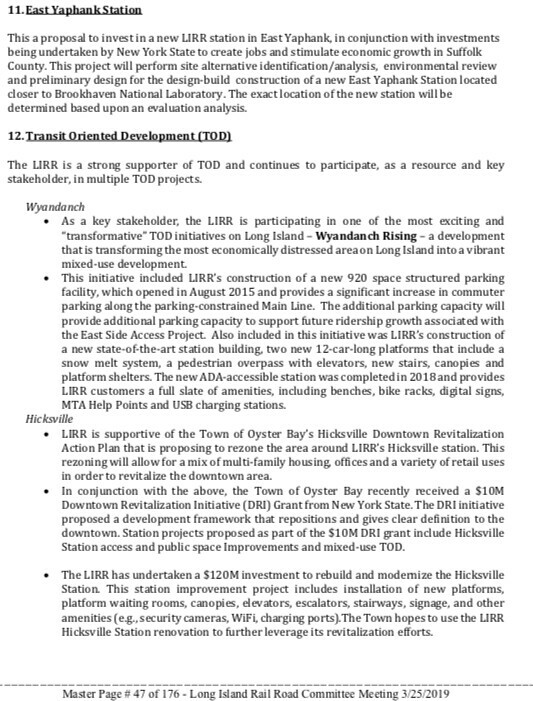 East Yaphank stop a waste unless they plan on significantly increasing service east of Ronkonkoma. Blame Prince Andrew and his asinine AirTrain to Nowhere. 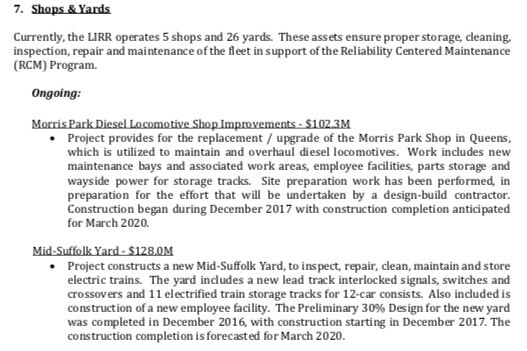 Since the AirTrain is going to dump everyone at Willets Point, not Flushing-Main, the former needs to be fully equipped to handle the planned increase in patronage since most riders are going to backtrack to Manhattan via the LIRR. Yup. Look for the station to be renamed.